If you live or work in the DC area, chances are you’ve used Metro–bus or rail–to get where you’re going in the city. I’ve lived in the area for nearly 15 years now and there was only a 3-month period where I wasn’t using it regularly for my commute. In that time, there has been plenty to complain about, though most of it was commiserating among friends–and the occasional blog entry, but with the strong advent of social media, DC area commuters are finding a vibrant, real-time medium for not only sharing gripes, but communicating problems, delays and the odd triumph as they happen. 1. Why FixWMATA? Many people in the DC area would agree–strongly–that WMATA has declined in many areas, but few would make it a personal project or, dare I say, crusade as you have. What prompted or inspired you to create the website and twitter account? I actually started off as "POPTDC" or People of Public Transit DC but the guy that runs People of Public Transit asked me to stop using the name so of course I did. When looking for a substitute name I wanted one that was short but also clearly identified my purpose without being offensive. FixWMATA seemed to fit well. I got started down this road last year when I saw a need and tried to fill a need. 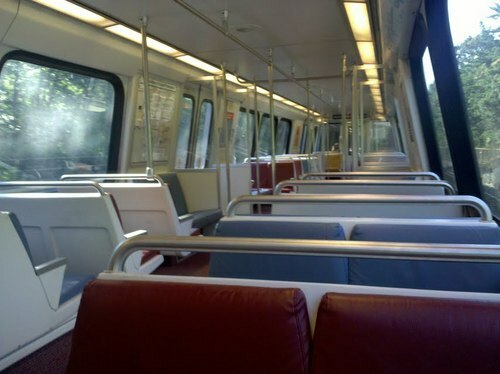 I saw that people were complaining on Twitter about the WMATA "HotCars" yet nobody was responding to them. As a rider I too felt their frustration so I set out to try to help them. I saw that others already had a presence in the WMATA Twitter world – UnSuckDCMetro does his thing well so I didn’t want to step on his toes, at the time the media did their thing well so I didn’t want to step on their toes, and there were a few other accounts that served their purpose well and I didn’t want to duplicate their efforts. What I didn’t see was anyone taking an analytical approach to the HotCar problem so that’s where I started. I started tracking the HotCar numbers and the list lead to the website. 2. How long have you lived in the Metro DC area? Have you lived in cities where public transportation was better or worse than the current condition of WMATA? I’ve lived in DC since April of 2010 and have been riding WMATA since then. Before DC I lived in Houston – which has a sparse public transportation infrastructure, New York/Manhattan – which has a fantastic but aging MTA system, and I’m originally from Atlanta and grew up on MARTA. Each of these cities have their own unique set of problems with their rail systems. Atlanta, for example, has a culture of "not in my backyard" so the rail line is very limited. Houston has a very high water table making underground rail nearly impossible so they rely on light-rail above ground which is also limited. New York’s MTA is my favorite but they also went through a period of aging fleet and chronic problems. The thing I saw about WMATA is that with just a few changes this system could be AMAZING. The stations, arguably, are beautiful in their own right, the rails run to the appropriate areas (again, it could be better), and people here mostly have no problem taking public transportation on a daily basis. 3. In your twitter bio and recent Unsuck DC Metro post, you mention “[working] together to make WMATA better.” While I can see that daily commuters are contributing information and data, are you in touch with anyone at WMATA on a regular basis beyond the occasional conversation on twitter? Good question. My purpose IS for everyone to work together, and I honestly do mean that. Everyone has a role to play here. When I see people/WMATA shun UnSuckDCMetro, for example, it concerns me. He, like others out there, provide an excellent service and point of view that when combined with the appropriate response from WMATA CAN make a world of difference and get the problems solved resulting in a safer, nicer ride for customers and in the end more money for WMATA. When everyone cooperates there’s no losing here. 4. From my personal observation, the FixWMATA account appears to be trending away from its previously positive tone to one that’s much more critical. Is that a reflection of WMATA response, rider input, your own personal experiences or any/all of the above? When I started the HotCar list this year I sat down with Dan Stessel and we had a great conversation about the Twitter world. He listened to my concerns about the HotCars and agreed to take my list and nightly get that to the maintenance workers to get the problems resolved as they were identified. This was what I had envisioned – riders report the problem on Twitter, me keeping a list for easy reference, and WMATA responding with the follow-thru on the fix. I assumed Dan was doing his part but when I noticed the HotCar numbers getting worse, not better, I started questioning Dan and didn’t get any response. To this day I still haven’t received a response. If Dan could communicate which cars were fixed the night before I could give them "credit" for it on the list and the conversation would be in their favor. The riders and I have kept our end of the "working together" pact – WMATA has fallen short. This prompted both anger and frustration from me and I know it’s shown on Twitter. I don’t appreciate being lied to and Dan has either straight faced lied to me or he simply gave me lip service. I do hope this situation changes but for now I’ll continue to work with the riders to make WMATA better. 5. Akin to a “concerned citizen,” you do this on your own time for free, but more interestingly, you do it anonymously. There’s a mix of anonymity and personal identity on DC blogs and twitter accounts. Do you feel that associating a more public name and face would detract from the mission of FixWMATA? That’s an unknown, isn’t it? On one hand I really do want the HotCar situation to get fixed and will do whatever is necessary to bring attention to the cause. If that involves "coming out" I’ll consider it in the right forum. I’ve long believed that I’m not what should be focused on – the HotCar problem deserves the attention, so I’ve kept myself out of it. For example, I try not to mention race, religion, sexual orientation, etc in my tweets as those are all part of me but not part of the HotCar problem (that I’m aware of). One area I do blur that line is in regard to handicapped and/or disabled individuals. I happen to be a very healthy guy but I have empathy for anyone that has to traverse the WMATA rail system on a daily basis when already faced with physical challenges. It’s not right for WMATA to make customers in wheelchairs feel like second-class citizens for example. 5.1 If you could sum up the mission of FixWMATA in a 140-character tweet to be preserved by the Library of Congress, what would it be? "I’m here to work with anyone interested in making WMATA a better system by bringing to light the problems and seeking the solutions." I’d like to thank FixWMATA for their time and being my first guinea pig. I’m no journalist, but I think we all have questions that can’t be answered via twitter or a blog comment. I look forward to highlighting other locals soon! If there’s someone out there you’d like to see in a future 5.1, drop me a line or let me know in the comments! 1 Other excellent sources for WMATA-related news, humor, gripes and satire are Unsuck DC Metro, notwmata, FixMetroBus, Metro Protocol, Moving Momentarily, Washington MetroFail and Metro’s Advocate… to name a few. Thanks for the opportunity to be on your blog! Thank you for putting up with my nosey questions! While a lot of us throw our gripes and whines into the internets, you’re doing a good job collecting the data that it will take to keep WMATA accountable. If they ever respond to you, that is. This is an excellent addition to the DC blogosphere. I follow FixWMATA but didn’t know the origins or intent behind the Twitter account. Thank you for shedding some light on them! Looking forward to reading more 5.1 segments. Thanks FixWMATA for compiling the hotcar and hotstation lists. I appreciate it and it’s probably one of the only ways that users of the system can make changes. Keep applying pressure.